A business process is a set of related tasks or activities performed to produce a product or service. Business processes exist in any type of company, independent of size or industry. Internal and cross-company processes are the nerve tracts of any given company. If they are clearly defined and also optimized on a regular basis, they will drive competitiveness in the long run. Customers must be provided with products and services before competitors can establish themselves, and the ability to respond to changing market requirements is a major factor of business success. Business process modeling is the graphic representation of a company's business processes. Process modeling aims at graphically describing the process flow and providing information on the company so that even complex processes remain transparent. The most important method of modeling a business process is the event-driven process chain (EPC). Event-driven process chains are an industry standard in business process modeling. Experts can use this business-related notation for documenting and optimizing their workflows. The free modeling tool ARIS Express supports the free modeling of business processes with its model type 'Business model'. The most common business process constructs such as branches or loops are provided as fragments in ARIS Express, thus enabling you to have an easy start to the world of process modeling and flow charting. In a model of the "Business process" type, the process organization can be represented with its activity elements, data elements, and organizational elements. 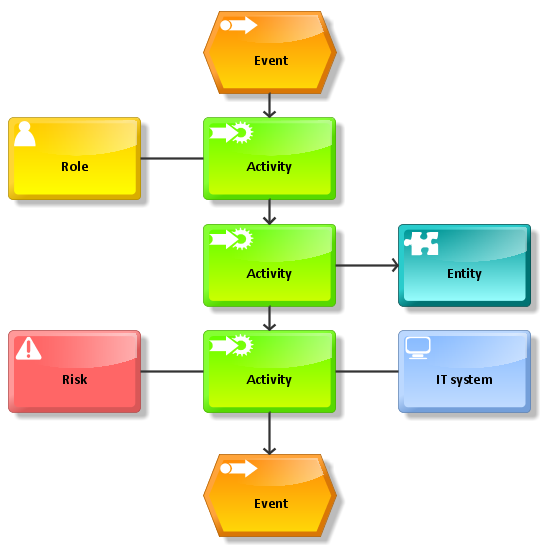 The sequence of activities in terms of a business process is represented in process chains. You can model the start and end events for each activity in the process. Events are both triggers of activities and results of activities. As events define the state or condition that cause an activity to start as well as the state that defines the completion of an activity, the start and end elements of a business process are always events. An event may be the source of several simultaneous activities; on the other hand, an activity may result in several events. To represent these branches and processing loops in a business process, a rule in the form of a circle is used. However, the connections do not just act as a graphic rule, but also define the logical links of objects. The following example shows a business process model that is directly embedded with the interactive model viewer. You can download it and edit it for free in ARIS Express. You can also use the video tutorials provided to find an easy way into the world of ARIS.